with my best wishes for a happy and successfull year 2012 comes here the first update for 2012 featuring a variety of new collections and indiviudal works. In the new year, also the fourth set of the bKa’ gdams gsung ’bum phyogs sgrig (vols. 91–120) will hopefully be published very soon. On top of the material that was already announced before, also the third set of the Bod kyi lo rgyus rnam thar phyogs bsgrigs (vol. 61–90) was handed over to the publication house and should be due to the second half of 2012. I will be happy to upload the dkar chag as soon as it has been finalized. Furthermore, a couple of new titles in themKhyen brtse’i ’od snang series will be published. 1. Bod kyi lo rgyus rnam thar phyogs bsgrigs thengs gnyis pa, vols. 31–60 (dpe cha) and 1 vol. 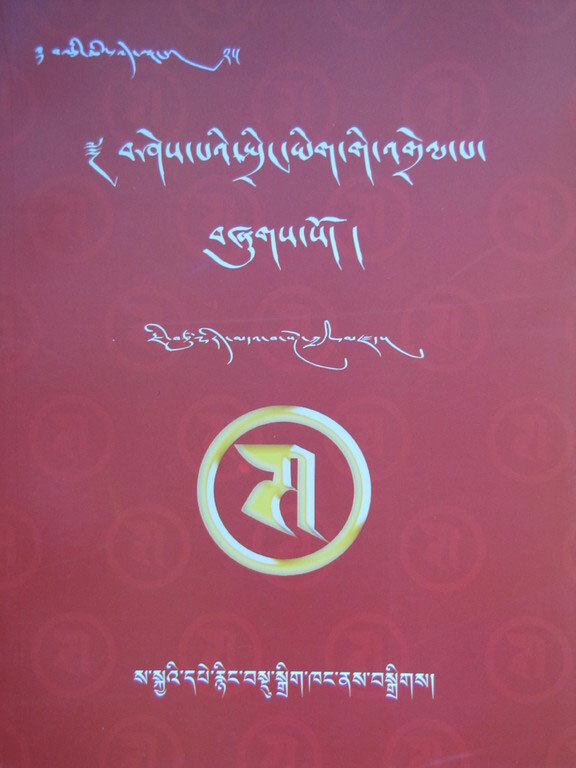 dkar chag (book format). mTsho sngon mi rigs dpe skrun khang, 2011. ISBN 978-7-5420-1532-7. The second set in the collection of religious-historical works and biographies includingnumerous heretofore unavailable works. 1. Ting ’dzin bkra shis (rtsom sgrig ’gan ’khur) and gTsang Chos ’dzin (gdan zhu rtsom sgrig pa). rJe btsun ngag dbang yon tan bzang po’i gsung ’bum. 8 vols. (hard cover). Mi rigs dpe skrun khang, 2011. ISBN 978-7-105-11520-4. 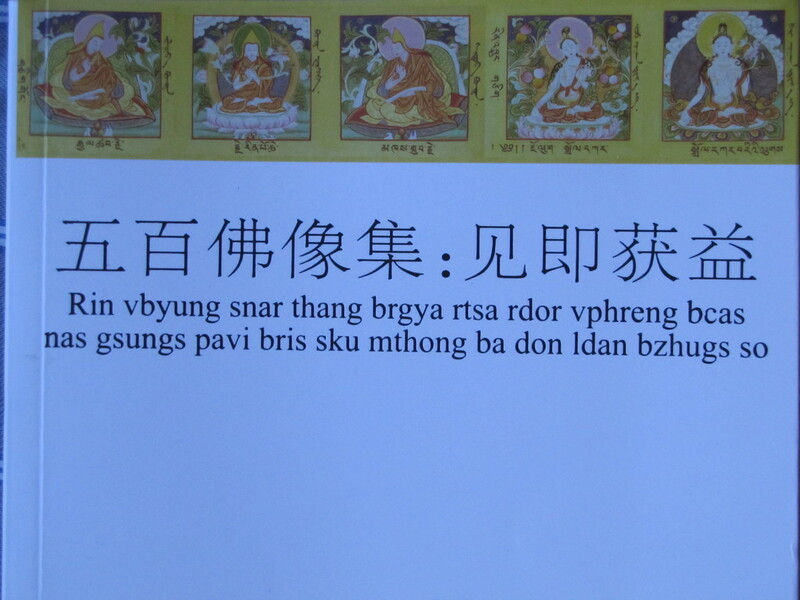 The Collected Words of the Jo nang master and mKhan po of ’Dzam thang rJe btsun Ngag dbang yon tan bzang po (1928–2002). 2. dByangs can lha mo and Karma tshe ring (dpe sgrig ’gan ’khur ba); Rig ’dzin ’gyur med (sgrig pa po). mDo sngags gzhung chen brgyad. 6 vols. (soft cover). bKa’ brgyud dpe rnying myur skyob rig tshogs. Si khron dpe skrun tshogs pa and Si khron mi rigs dpe skrun khang, 2011. ISBN 978-7-5409-4835-1. In total, the dkar chag lists the following 14 volumes in this series: vols. 1–4: ’Dul ba, vols. 5–6 mNgon pa, vols. 7–8 Tshad ma, vols. 9–10 Phar phyin, vol. 11 dBu ma, vol. 12 rGyud bla ma, vol. 13 Zab mo nang don, and vol. 14 rGyud brtag gnyis. The 6 volumes that are published so far have been published as kind of sub-set of this larger collection and are not for sale individually. 3. Dhī: tsha Mun ’joms sgron me (b. 1963). gZhan phan gzi ’od ’phro ba’i zhabs rjes. 4 vols. (Vol 1: 12, 6, 423 pp. ; Vol. 2: 8, 5, 409 pp. ; Vol. 3: 12, 2, 454 pp. ; Vol. 4: 8, 4, 476 pp. ; soft cover). Mun ’joms sgron me’i dpe tshogs. 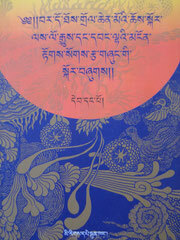 Mi rigs dpe skrun khang, 2011 (2nd ed.). ISBN 978-7-105-06635-3. 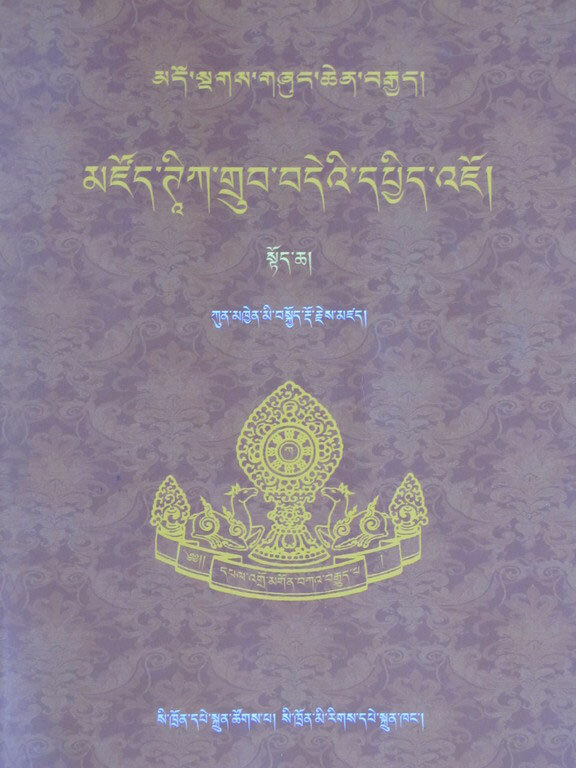 The Collected Works of Dhī: tsha Mun ’joms sgron me (b. 1963). 4. sGrol ma chos mtsho ('gan 'khur ba) and 'Chi med rig 'dzin (gtso 'gan pa). Bar do thos grol chen mo'i chos skor las lo rgyus dang dbang lha'i mngon rtogs sogs rtsa gzhung gi skor. 7 vols. (511, 489, 475, 503, 489, 470, 475 pp.). Mi rigs dpe skrun khang, 2011. ISBN 978-7-105-11603-4. 5. bSod nams rtse mo and Ma ṇi 'bum (spyi khyab jus 'god pa). rJe shar gdong blo bzang bshad sgrub rgya mtsho'i gsung 'bum. 10 vols. (hard cover). Mi rigs dpe skrun khang, 2011. ISBN 978-7-105-11678-2. 1. bShes pa’i phring yig gi ’grel pa. Contains the bShes pa’i phring yig gi bsdus don by ’Jam mgon Sa skya Paṇḍi ta (pp. 1–4), the bShes pa’i phring yig gi ’grel pa don gsal by rJe btsun Red dma’ ba (pp. 5–110), and the Legs par [bshad pa] bshes pa’i phring yig gi rnam bshad thar lam bde ba’i them skas by Rong ston gzhung brgya pa chen po (pp. 111–161). Sa skya’i dpe rnying bsdu sgrig khang, no. 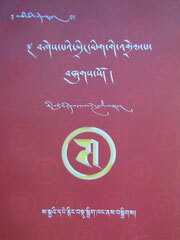 25. bKra shis chos ’phel rig gnas las bya khang nas spel, 2, 161 pp., 2011. No ISBN. I recently received two more sets of the Collected Works of Red mda’ ba. Due to the fact that the covers of some volumes are a little worn out, I offer the whole set for the reduced price of € 45,-. 1. 瑞士苏黎世大学民族博物馆版本. 五百佛像集 : 见即获益 / Rin vbyung snar thang brgya rtsa rdor vphreng bcas nas gsungs pavi bris sku mthong ba don ldan bzhugs so. 中国藏学出版社, 4,34, 12, 618 pp., 2011. ISBN 978-7-80253-338-7. The Chinese edition of the Icons Worthwhile to See from the Ethnographic Museum of the University of Zürich. 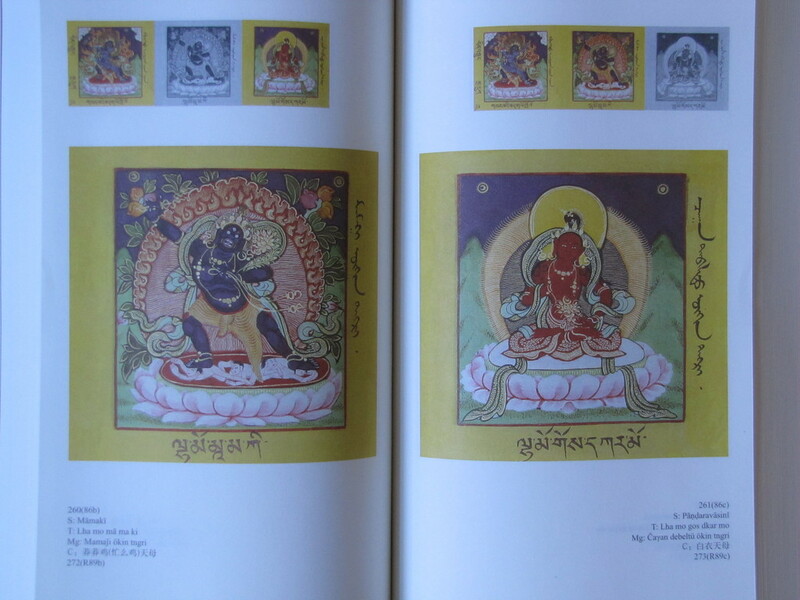 Includes over 500 colored images with captions in Sanskrit, Tibetan, Mongolian and Chinese, the “Introduction to the Collection of Five Hundred Buddha Images” in English (pp. 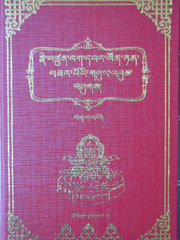 523–534), and an index of Sanskrit, Tibetan, Mongolian and Chinese Names. 1. Luo Hong and Toru Tomabechi (critically edited by). 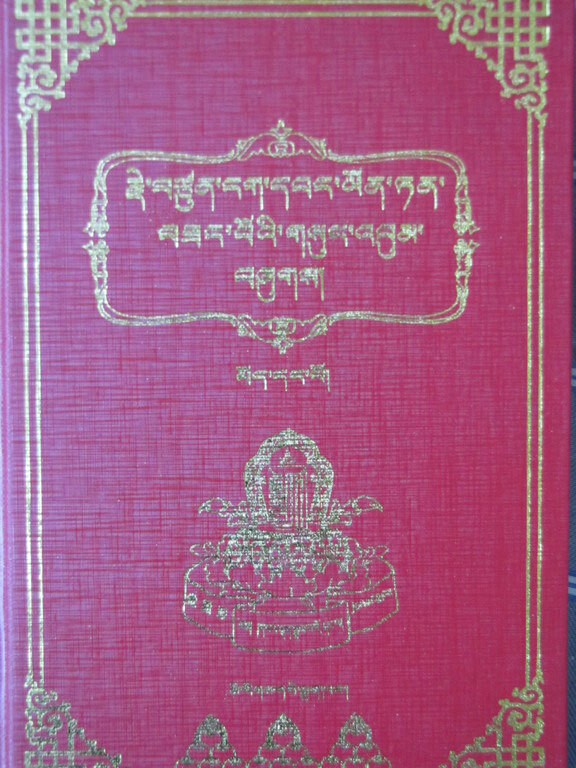 Candrakīrti’s Vajrasattvaniṣpādanasūtra (Vajrasattvasādhana). 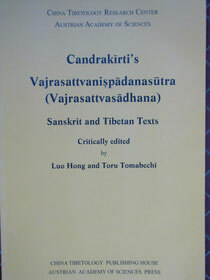 Sanskrit and Tibetan Texts. 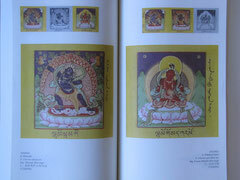 Lhagpa Phuntshogs and Ernst Steinkellner (eds. 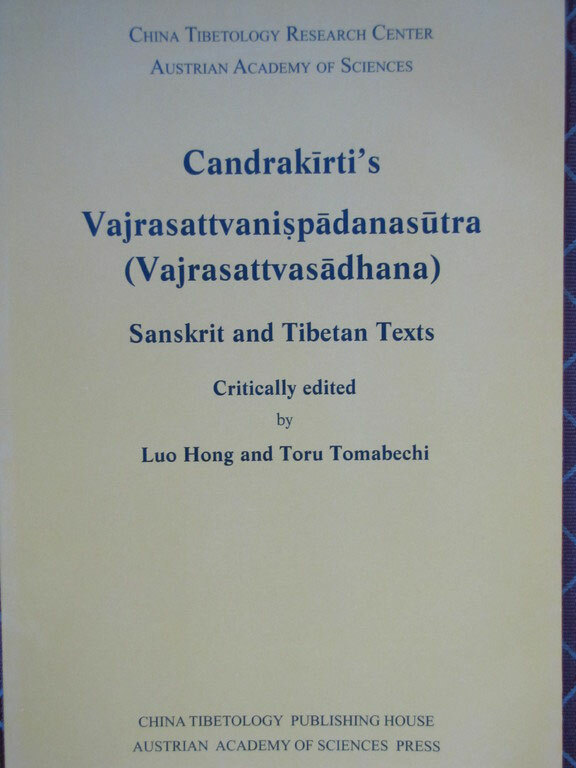 ), Sanskrit Texts from the Tibetan Autonomous Region, no. 6. China Tibetology Publishing House / Austrian Academy of Sciences Press, xxxiv, 98 pp., 2009. ISBN 978-7-80253-207-6. 2. Tshe dbang (b. 1969). sPu rgyal dus kyi bang so’i zhib ’jug. Bod ljongs slob chen gyi “211 bzo skrun” dus rim gsum pa’i ’dzugs skrun grub ’bras. Bod ljongs mi dmangs dpe skrun khang, 4, 2, 208 pp., 2011. ISBN 978-7-223-03275. 3. Pa tshab Pa sangs dbang ’dus. sPu rgyal bod kyi rdo brkos yi ge phyogs bsgrigs kyi ma yig dag bsher dang de’i tshig ’grel dwangs sang gangs chu. Bod ljongs mi dmangs dpe skrun khang, 4, 2, 233 pp. and 23 pp. with colored images of the stone pillars and rock inscriptions, 2011. ISBN 978-7-223-03252-0. 4. sPrel nag pa Rig ’dzin grags ldan (ed.). dPal don grub rgyal la zhib ’jug byas pa’i dpyad rtsom phyogs bsgrigs. Kan su’u mi rigs dpe skrun khang, 3, 676 pp., 2009. ISBN 978-7-5421-1620-8. 5. Cha har dGe bshes Blo bzang tshul khrims (1740–1810). rJe tsong kha pa’i rnam thar chen mo. 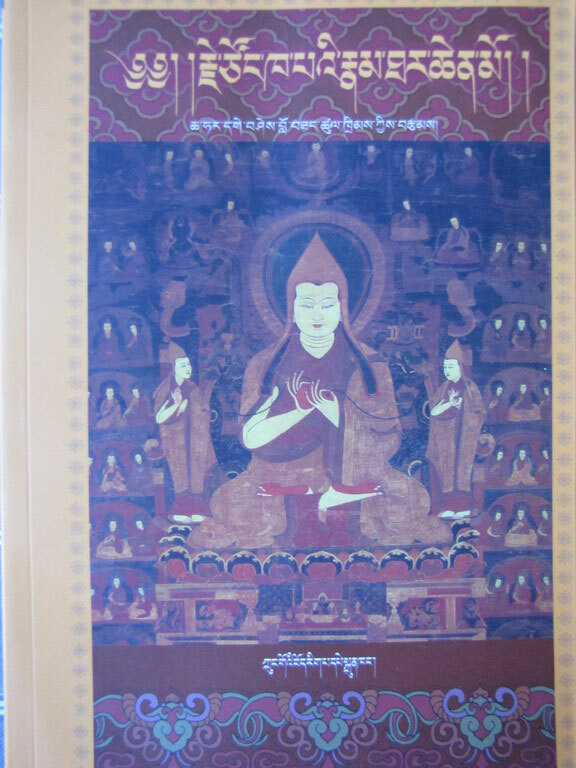 Krung go’i bod rig pa dpe skrun khang, 2, 485 pp., 2011 (2nd ed.). ISBN 978-7-80253-380-6. 6. Byang chub ’Jam dbyangs skyabs (b. 1956). mNgon brjod rgya mtsho’i chu thigs kyi mchan ’grel. 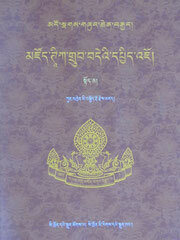 mTsho sngon mi rigs dpe skrun khang, 2, 221 pp., 2011 (3rd edition). ISBN 978-7-5420-0847-3. 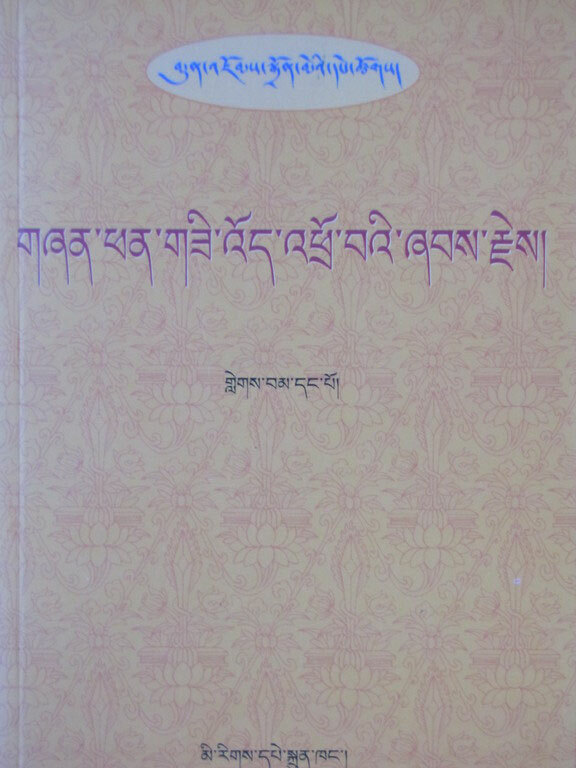 A commentary on dNgul chu Dhar ma bha dra’s (1772–1851) mNgon brjod rgya mtsho’i chu thigs. 7. Tshe brtan bkra shis. Tshe brtan bkra shis kyi bod rig pa’i ched rtsom phyogs bsgrigs. Bod ljongs slob chen gyi “211 bzo skrun” dus rim gsum pa’i ’dzugs skrun grub ’bras. 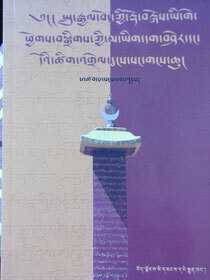 Bod ljongs mi dmangs dpe skrun khang, 2, 164 pp., 2011. ISBN 978-7-223-03242-1. 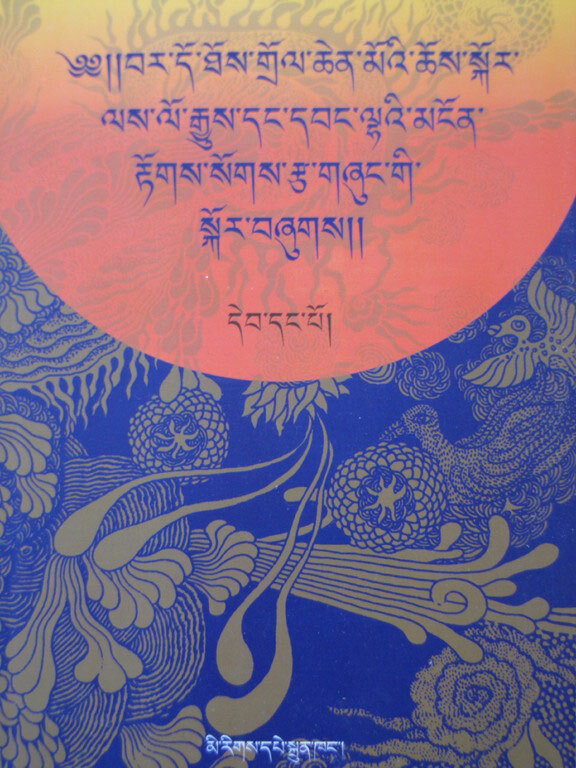 Articles in Tibetan and Chinese. 8. Mus po and Nga dbang sgrol ma. Rwa skor mkhan chen thub bstan nor bu'i mdzad rnam dang gsung chos phyogs bsdus dad pa'i snang ba 'dren pa'i 'od snang. Mi rigs dpe skrun khang, 6, 422 pp. (hard cover), 2011. ISBN 978-7-105-11684-5. 9. Gling dbon Padma skal bzang. De snga'i bod sa gnas srid gzhung gi gzhung yig thog gi tha snyad spyod srol dang 'brel yod phyogs bsdus gsal 'grel. Mi rigs dpe skrun khang, 1, 200 pp., 2011. ISBN 978-7-105-11331-6. 1. Bod ljongs zhib ’jug 2011 (1–3). 2. 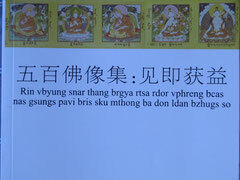 Bod ljongs slob grwa chen mo / Journal of Tibet University 2011 (1–3). 3. Bod ljongs sgyu rtsal zhib 'jug 2011 (1). Each volume costs € 4,-.